A freed black slave, he aided Toussaint L'Ouverture in the liberation of Haiti and was army chief under Dessalines. When the latter declared himself emperor, Christophe took part (1806) in a successful plot against his life and was elected president of the republic. 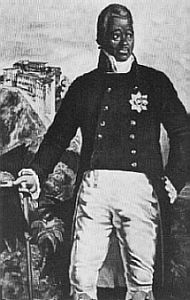 Christophe, a pure-blooded black, then waged a savage and inconclusive struggle with Alexandre Pétion, the champion of mulatto supremacy, who retained control of S Haiti. In 1811, entrenching himself in N Haiti, Christophe declared himself king as Henri I and entered upon an energetic but tyrannical reign. He created an autocracy patterned after the absolute monarchies of Europe. Compulsory labor enriched his fiefdom. Christophe surrounded himself with lavish, and sometimes ludicrous, magnificence; the pomp and splendor of his reign are still shown by the ruins of the citadel of La Ferrière, a formidable fortress on top of a mountain, surrounded by precipitous cliffs, and of the fabulous palace of Sans Souci, at Cap Haïtien, his capital. In 1820, when he was suffering from partial paralysis, revolts broke out. In despair, Christophe committed suicide. See his correspondence with Thomas Clarkson, ed. by E. L. Griggs and C. H. Prator (1952, repr. 1968); biography by Hubert Cole (1967); Charles Moran, Black Triumvirate: A Study of L'Ouverture, Dessalines, Christophe (1957). Haiti is the first Black Republic! We wish for calm and peace so we can grow as a people.